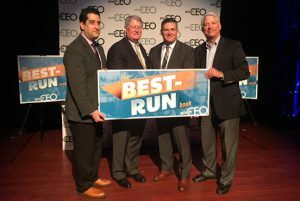 Vienna, VA February 9, 2017 – Cordia Partners is honored to be named by SmartCEO as a Best-Run Company for 2017!! According to SmartCEO, a best-run company must exhibit the highest standards in nine critical areas: process, vision, customers, culture, leadership, communication, growth, brand and talent. We are flattered to be named with other leading companies as an organization that creates lasting value within our community and to be recognized for leadership, strategic vision, and character.